Getting to the gym sometimes is hard enough, not to mention the extra time spent to prepare different outfits for running errands, meeting a friend for lunch, and hitting the gym. 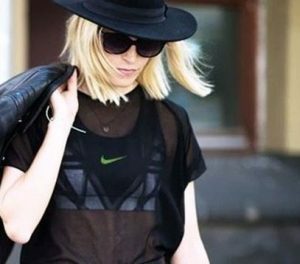 Turn your activewear into streetwear with just a few simple tricks. You never know what plans may come up while you are on your way to the gym, don’t miss out just because you are in your workout gear. Athleisure is one of the biggest trends yet, mixing street style with active wear. Keep the leggings, keep the sneakers, and throw a sheer top over one of your coolest sports bras. This will make for a stylish athleisure look, and a sheer shirt after a hard work out…what could be better! Sheer Panel leggings not only give you extra breathability during your workout, but they also add an easy element of style to your overall look. Keep them on after the gym, with a comfy long shirt and you are good to go. If you are going out after hitting the gym, but don’t have time to make a complete wardrobe change, just keep your sports bra on and use it as a crop top, pairing it with anything from high-waisted jeans to a skirt. Probably the easiest one yet, keep all your workout clothes on and just add a leather jacket. Leather jackets automatically add a sense of style and edge to any outfit…even your workout clothes! I Can See Clearly Now…Locations Across the Globe with Crystal Clear Waters! !